toastup! ≈ archives » Happy holidays. I hope December finds you well and with family or friends. I was hoping to have Cuckoo 1.2 ready for you by now, but time seems to have gotten away from me. 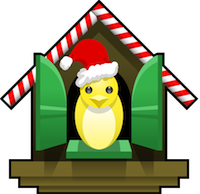 While you’re waiting, here’s a little treat: an audio clip of sleigh bells you can use with Cuckoo for a little bit of holiday cheer on the hour (or, you know, whenever). Download it below, double-click the .zip to expand, and then place the mp3 in your Library/Sounds folder. Happy holidays, and I’ll see you in 2008.